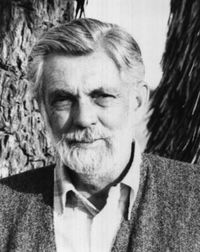 Charles Kenneth Johnson (July 24, 1924 - March 19, 2001) was the second president of the Flat Earth Society. After the death of Samuel Shenton, Johnson (together with his wife Marjory) took over the administrative duties of the FES along with his wife. They operated from their own home in Lancaster, California. Under Charles K. Johnson's leadership, the society's membership rose to over 3,000 members. Johnson promoted Flat Earth Theory and the Flat Earth Society by passing out flyers, newsletters, and other materials upon request to the public. Johnson was often interviewed for his views on Flat Earth, and even made an appearance in an ice cream commercial. Though the Flat Earth Society itself maintained a scientific standpoint, Johnson firmly believed in Biblical reasoning for supporting a flat earth, often citing scripture for verses describing the earth as flat. Johnson was also an early believer that the moon landing in 1969 was a hoax. Since then, many have come to believe this for various reasons, but Johnson believed the landings were part of a conspiracy to make people believe in a round earth rather than a flat earth. A house fire destroyed much of the contact information of the FES, and shortly afterward Johnson's wife died. This was a heavy blow to his administrative abilities over the FES, and led to a decline in membership which continued until his death in 2001. This page was last modified on 8 December 2014, at 17:11.